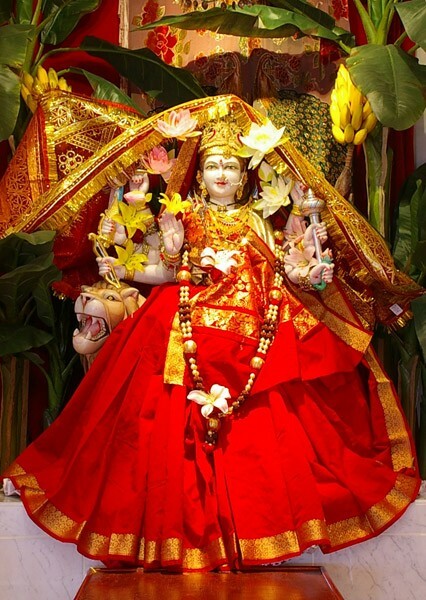 Mother Durga and Chandi incarnated on Earth as combined powers of Mahalakshmi, Mahakali and Mahasaraswati. On her celestial creation, all the Gods gifted their powers and weapons to Mother Durga. With assimilation of God's powers, Mother Chandi became the ultimate power and destroyed the powers of Chanda-Munda, Rakta-Beeja, Mahishasura and many other Rakshas (demons) to make the Earth peaceful for devotees. Devotees pray to Mother Durga by reciting the famous Durga Saptasati book. Devotees perform special prayers and celebrations during the nine days known as Navarathri (nine nights) festivals. Hindus celebrate Nav-ratri twice a year. The first is known as Vasant Navrathri - commences on the first day of the bright fortnight (Shukl-paksha) of Chaitra month of the Lunar Calendar and on the ninth day of this Nav-ratri Ram Navami - the birthday of Lord Rama is celebrated. The second Nav-ratri known as Sharada (winter) Nav-ratri commences on the first day of the bright fortnight (Shukl-paksha) of Ashwin month of the Lunar calendar. At the end of this Nav-ratri, on the 10th day Vijaya Dashami - the death of Ravana and Mahishasura is celebrated with abundant happiness. All Gods giftedd Mother Durga different types of weapons. Mother Durga established many hands to hold these Weapons. Mother Durga's vehicle is Lion. Himalaya;s King Himvan gifted the Lion to her. Mother Durga is invoked by performing Puja and by fasting on Thursday.